February 13, 2017 9:00 A.M. Families and fishing enthusiasts across Ontario can fish licence-free from Saturday, February 18 through Monday, February 20. ▪ Wellington Street Sportsmens Club Annual Family Ice Fishing Event on February 20, 2017 at Wellington Street Sportsmen Club in Thames. 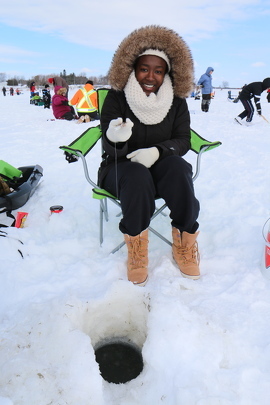 Remember to follow the rules for ice fishing in Ontario and stick to the conservation daily fishing limits to help protect our province's fish populations. Recent mild weather may have made ice on many bodies of water unsafe, so be sure to check with local ice hut operators before venturing out and make safety a priority. Anglers buy approximately 1 million licenses to fish in Ontario each year. This summer, Canadian residents can fish without a licence in Ontario from July 1-9, 2017. New anglers can borrow fishing gear for free through the Tackleshare program. 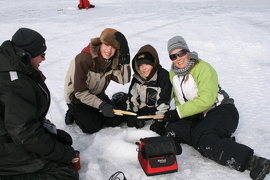 Check out the Ontario Family Fishing Events website for events near you. Pick up the basics of fishing with the Learn to Fish Guide. Plan your fishing trip with the Fish ON-Line tool where you can search by lake, type of fish and check zone limits. This document was published on February 13, 2017 and is provided for archival and research purposes.